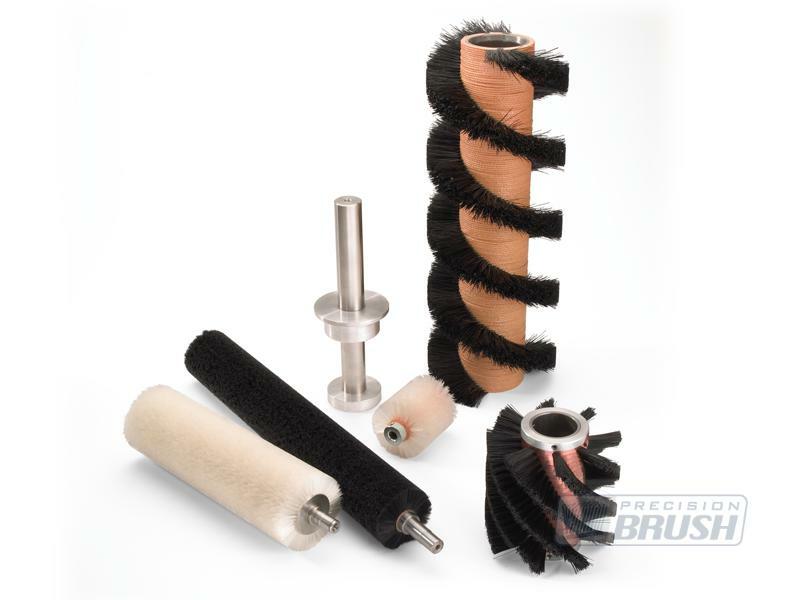 There are many uses for spiral shaped brushes from removing products from a conveyor belt or through a tube, to lightly cleaning or applying a substance to a product. The spacing between loops can be up to 12 inches or more depending on the other specifications of the brush. The most common brush with this shape is made with the metal channel on the inside of the brush and the filaments pointing outward. 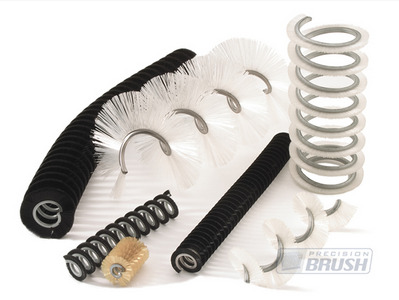 These are called Open Wound Cylinder brushes or Open Coil brushes. 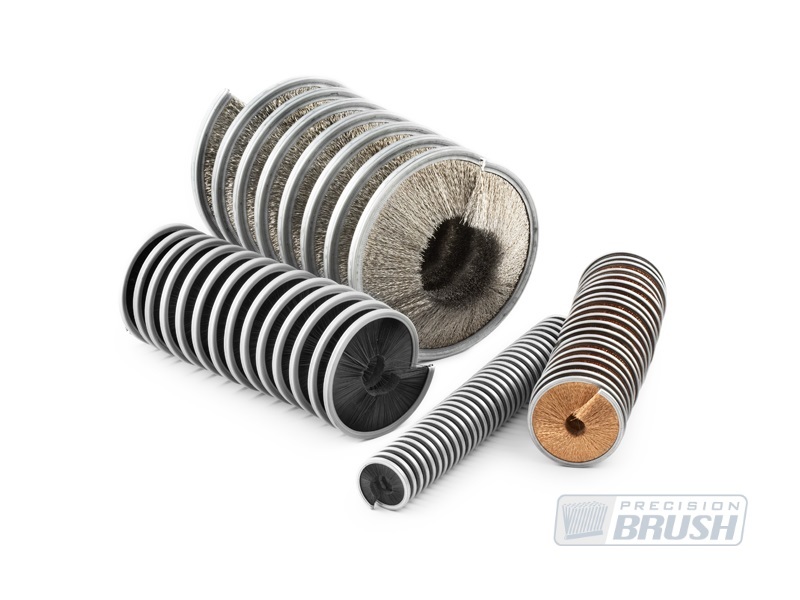 They start as regular wound cylinder brushes and are then stretched to the required pitch, sometimes referred to as lead. With this construction, the brush is mounted on a shaft and the filaments work as the brush rotates. 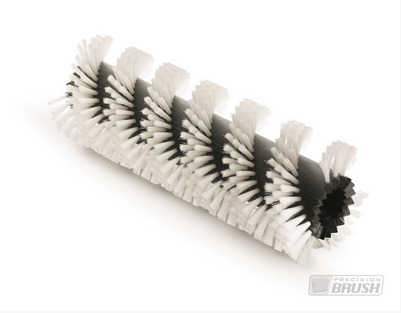 These brushes start as straight strip brushes and are formed into a cylinder shape with the metal on the outside and the filaments pointing towards the center. The brush is then stretched open to the required pitch, sometimes referred to as lead. Staple Set brushes can also be made into spiral shaped cylinders. The core usually is custom machined for a specific brush application or mounting and the filaments are installed into the holes that are drilled to your desired pattern. Epoxy Wound brushes are also available in spiral patters. This brush is best suited for applications requiring higher RPMs or if the whole brush and shaft require balancing. The shaft can be custom made or supplied to us. The filaments are wound directly onto the shaft and held with epoxy which is then cured. The brushes can be removed and shafts can be rewound many times.